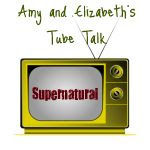 Every week, Elizabeth of As Usual, I Need more Bookshelves and I discuss several episodes of Supernatural. We are just starting our discussion of season 3. There are no words for how much I love this show, and I've actually already finished season 3 (short season). I loved it. Anyway, here's our discussion of the beginning of the third season. Synopsis: In the third season premiere, bracing themselves for the possibility of an apocalyptic war, Sam and Dean realize they have an enormous task: hunting down the hundreds of demons that escaped from the Devil's Gate. Amy: I thought the huge cloud of black demons was pretty darned scary. Elizabeth: That was one of the creepiest things I've seen on the show yet, because it just looked totally real up in the sky. Amy: Clearly Dean is going to live by eat, drink, and be merry for tomorrow we die! Elizabeth: He doesn't really have any reason not to anymore, does he? Amy: Did you like the new hunting couple? What did you think of their reaction to the Winchesters and Bobby? Elizabeth: Well, I can understand it - I mean, the brothers did kinda let out more demons than have ever been free before. I keep getting the feeling that, in general, hunters don't really get along. Amy: Yeah they all think they've got it right. Ever notice how solitary it is? Amy: I was not expecting that bar to be all demons! Elizabeth: That was unexpected, although it I guess it makes sense that they'd have someplace to hang out. Amy: Interesting that the demons were the sins, I found the demon explaining the similarities between humans and demons to be interesting. Elizabeth: The first thing I thought of was the movie Seven, and then Dean quotes, "What's in the box?" - I cracked up. Amy: I thought of that as well! One of the creepiest movies ever. Elizabeth: Once again, the writers show us how close the humans are to what they hunt - it was fascinating. Amy: Who's the blonde chick??? Elizabeth: I don't know, but she has to be trouble - pretty girls around Sam and Dean almost always are! Amy: Dean finally confesses that there is no way to stop him from going to hell, he made a selfish choice, and he's fine with it. Elizabeth: In some ways, it must be a relief - he's always been under such a burden to save Sam. Now it's over - he failed. What's the worst that can happen, when the worst has already happened? Amy: Yeah, but gosh! Going to hell!!!!! Elizabeth: Did you notice that the pride demon almost made it sound like the yellow-eyed demon had been protecting Sam from other demons? He said "Now you're fair game." Amy: I suspect the demon was protecting him....or at least all the other demons knew that Sam was sort of the chosen one and it wasn't a good idea to mess with him. Synopsis: Dean pressures Sam into traveling to Cicero, Indiana, so Dean can visit an old flame named Lisa (CINDY SAMPSON), with whom he had a tryst nine years ago. Elizabeth: Yeah, that was a great twist. For the first time Dean's confronted with the thought that there might be a consequence to his choice of lifestyle. Amy: and like...he hadn't seen her for 8 years! Why would he think she'd be like, woo-hoo, Dean! Elizabeth: I really did - they did such a great job of finding a little boy that looked like JA. Hilarious! Amy: How creeped out were you by the kids? Why are kids always so creepy??? Elizabeth: Here's what this show as taught me - if there is ever something strange going on, and there happen to be kids around, it's ALWAYS the kids! They are totally creepy. Amy: So the blonde shows up again and meets up with Sam and gives him a mission to find out what happened with him mom. Hmmm. Elizabeth: She knows way too much about his family. Elizabeth: I'm kinda trying to figure that out, too. Amy: I caved and bought it. Hopefully, it's good! Amy: I thought that mother had to be pretty darned sure that girl wasn't hers when she tried to drown her! Amy: I felt so sad for Dean at the end feeling he wasn't leaving anything behind. I think he'd make a great dad....so it's really too bad. Elizabeth: I think, especially after the djinn gave him a taste of a normal life, he's a lot more open to the idea of a family and roots. I really think he was hoping Ben was his kid, and I think it's something he would definitely be open to. I felt bad for him when it ended up that he wasn't. Amy: So what do you think was up with their mom? Were you surprised Ruby was a demon? How do you think she can help save Dean? Elizabeth: I knew something was up with her, so I wasn't totally surprised. I still don't know that everyone should just run off and do whatever she tells them to. I have thought something was going on with their mom, ever since they showed the night she died, and she looked at the demon and said, "It's you". I just want to know what that something is!! If she can help Dean out of his deal with the crossroads demon, she must be pretty powerful, because I don't know how you can get out of that deal. Elizabeth has our discussion of episodes 3 and 4. YAY! You got to the Ruby part!! I actually loved this episode because I thought it showcased what a great father Dean would be. But more than that it kind of left me feeling that Dean already is a great father. I mean he single handedly raised Sam didn't he? You'll have to write a post about the book and how/if it really relates to Supernatural in any way.